When Justine and Mae are assigned to work together to solve a string of ritualistic murders, they soon realize that their discoveries have exposed them to terrible danger. As their investigation races forward, unknown enemies and powers greater than they can imagine are gathering in the shadows, ready to reclaim the world in which humans are merely game pieces on their board. Richelle Mead is the #1 New York Times bestseller author of the hugely popular Vampire Academy series as well as its companion series Bloodlines. Her new series - Age of X - is an ambitious adult series set in a futuristic world of the Republic of United North America (RUNA) where religion is under heavy government control, genetics separates people into patricians who clung to their ethnic heritage and are marked by genetic defects and plebeians who are the result of the country's genetic mixing programs, and the hint of supernatural is ever present in a largely atheistic society. Sounds confusing? Don't be, there's plenty of explanation in this book to guide you. 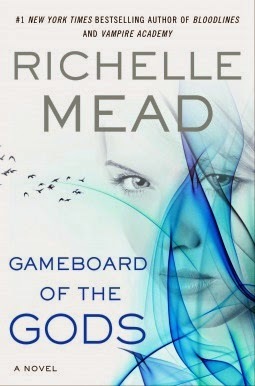 My first reaction to the Gameboard of the Gods is awe at the sheer amount of world building that Richelle Mead had put into this book. This is most definitely her most ambitious series to date. Everything from the countries - RUNA vs Eastern Alliance (EA) - to the transport to the tech that the people uses are detailed in this book. The comparison between the different societies and how they are run, the advantages of their system plus their flaws, have all been discussed at length. The sheer amount of information that have been introduced allows the reader to fully delve into this world and when the characters use their egos or discuss Cain, the reader is so well integrated into the fictional world that there is rarely any moments of confusion. The downside of such extensive world building is of course, the actions get bogged down by too much information. The overall plot of this novel, when you boil it down to its essence, is fairly straightforward. Someone, or a group of someones, are out there ritualistically murdering a string of what appears at first to be unrelated individuals. In any other suspense thriller, the mystery element would be at the forefront of the reader's mind whilst reading. However, in this book, it read like an introduction to the world of Age of X and discovering the killer was the secondary plot. What I also appreciate of Mead's writing is that all her characters are well-developed and flawed. Justin is a substance-abusing womanizing git whose remarks borderlines on being rude at times yet at the end of the day, his protectiveness of his family and those he considers he's indebted to redeems him somewhat. Mae is cold and quick to judge, but she is strong, can hold her own in a fight and is loyal to those under her protection. Despite what appears to be a low-rating for this book, I do have high hopes for this series and am very excited about the next book, The Immortal Crown, which just came out a few days ago. Now that the world building is fully complete and all the major characters are established, I feel this series will improve by leaps and bounds. Fans of Richelle Mead's Vampire Academy series may be disappointed as this is nothing like her previous series but I'd still recommend this book for those interested in something a bit more complex. I haven't read anything by Richelle Mead yet! I think I'd start with her VA series, though, because adult fantasy tends to make me feel small. Haha! I just get so so lost very easily. x) But! I do love it that so many reviewers say she does excellent characters. That is awesome. Well-developed characters is what gets me happy every. single. time. I haven't yet read this book. I love VA/Bloodlines, so I'm a little concerned of my expectations about this new series, which is probably why I'm holding off reading it. I am, however, anxious to read her upcoming book, Soundless. Do you plan on reading it?